It is not a dargah or a shrine, it is actually a "sufi temple" (as they call it themselves) of a I think a dutch sect that is inspired by Hazrat Inayat Khan RA. I think you are aware of this movement that have created some kind of universal religion. They call themselves Sufi movement Netherlands. http://www.soefi.nl/2activit/eredienst.htm on this site there is information in dutch about that movement, and somehwere in the middle of the page you can see another photo of what is actually inside of the building in Katwijk, the Netherlands. 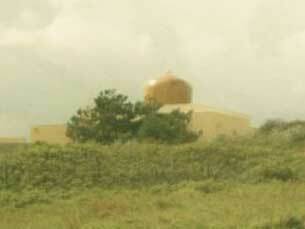 So I think it is more a building in which they meditate and have gatherings.